So should we all just write the millennials off as “needy” or “entitled” and hope that the next generation will be more loyal, dedicated, and ambitious? Or is this a case of not understanding what the needs and wants of the millennials truly are, and instead catering to what we think they want? Employers have changed workplace dress codes to include hoodies and jeans as the standard attire. They’ve adopted “dog at work” policies, set up break rooms with energy drinks in addition to the traditional coffee makers and water coolers, and even instituted benefits such as student loan assistance to get those debts paid down while the millennials are hard at work. But maybe that’s not what the millennials are looking for after all. Sure, they want to bring Gizmo to work and chug a Monster on their lunch break, but what are the big picture wants and needs that we’re missing here? In order to understand them on a deeper level, let’s look at the big differences that have shaped this millennial generation. First, they are largely the product of latchkey upbringings. Their parents were at work for 40+ hours a week, and millennials resent that and want to be rewarded for what they produce (results) not time on the clock. Secondly, parents of millennials kept their kids busy! They didn’t just play one sport at a time, they went from gymnastics practice to cheer camp to softball tournaments all in one day. Parents attended and praised their kids through all of this, maybe overcompensating for their lack of quality time during the workweek by being overly involved on the weekends. The result of this? Millennials tend to need more frequent feedback, and expect highly personalized attention from their bosses. 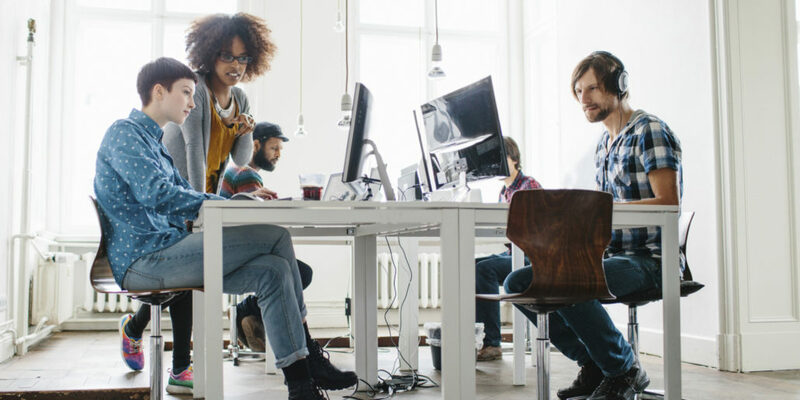 Lastly, millennials are the most technologically connected generation we’ve ever seen in the workplace. They have visibility into organizations thanks to social media, instant access to apply for new opportunities, and expectations for leadership to be transparent and move quickly. So what does this mean and how can you make changes in your workplace to retain top talent from the millennial generation? Make sure there is a sense that the work has a purpose – millennials want to know they are making a difference. Instead of adopting an attitude of a boss, try working as a coach. According to Research Director at Gallup, Dr. Jim Harter, “Coaches drive performance by being approachable human beings. They get to know people as a whole person. They discover what they’re best at, mentor their growth, and provide ongoing feedback. They’re advocates.” Strive to be a coach in the workplace! Provide more frequent feedback. It’s time to toss out the annual performance review in exchange for a more updated feedback system – monthly meetings, feedback throughout the project, or weekly check-ins are all great ways to provide this feedback to employees who crave the attention and approval of their boss/coach. Focus on the strengths of each employee, and build work teams around those strengths. As a group, millennials are highly educated and are highly attuned to their need for growth. They want to picture their futures, and they need to know where they stand, where they’re going, and how they will get there. Your support as their leader is extremely crucial to all of this playing out just right. Developing your employees will lead to increased productivity, higher levels of performance, and a drive to be engaged and work hard to meet your company’s goals. By investing a little bit of time and energy into all of your employees, and finding out what makes them tick, you will be reaping the benefits tenfold in 2017.